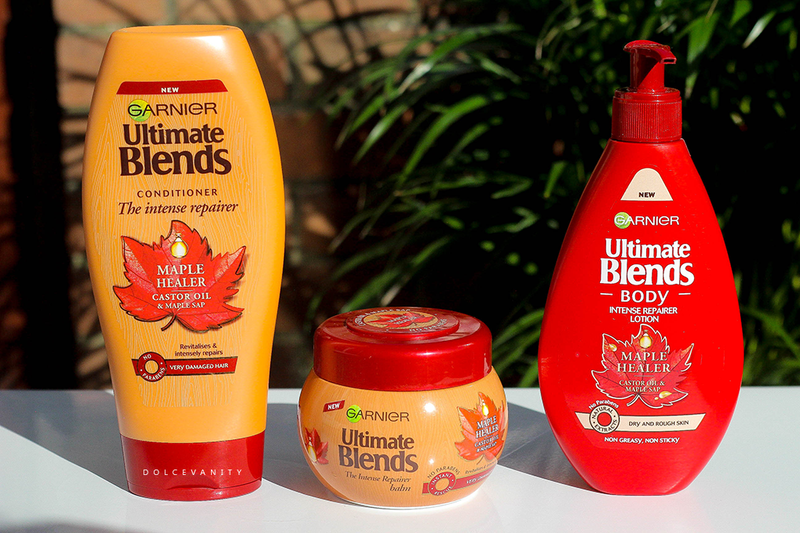 Garnier Ultimate Blends - Maple Healer. Garnier Ultimate Blends Maple Healer with Castor Oil and Maple Sap, this new range is to help repair neglected, heat-damaged hair. What's nice is that this range has no nasties within the ingredients therefore our hair and health should benefit a lot more from that aspect. I wanted to try this because even though it's been nearly 18 months since returning back to my natural hair colour, I've still got the blonde underneath so it's very easy for it to get dry and brittle. What my hair benefited from before was regular, weekly deep conditioning so getting back into that is key and I admit, it's where I started to slack. As this has Omega's 6 and 9 to help revive hair, it makes castor oil one of the best ingredients to put within these products, maple sap from the maple tree can withstand extreme temperatures therefore it'll help protect our hair from any further damage. I decided to try the conditioner and healer mask - I opted out on the shampoo as I'm not keen on many shampoos and I'm pretty happy with what I'm using. Conditioner, I can't get enough of for my hair. Once I rinse my hair free from shampoo, I completely coat my hair with the conditioner. It's creamy and gives my hair a nice slip as I brush through using either my tangle teezer or wet brush. Once rinsed out there's no dryness or problems and this is where the healer mask comes into it. It's a thick texture and I apply from mid lengths to the ends heavily in the mask and apply to the roots afterwards and clip the hair out the way and carry on showering. Although this has coconut oil within the ingredients it didn't bother my hair or skin which is a problem I am occuring as of late. The body lotion is paraben free and non-greasy. Even if I use quite a lot it doesn't get very greasy which is nice for some, I can take or leave the grease lol - not an issue. If you've got recurring dryness on your body this could be a good possibility to try to heal the skin. Dryness is annoying and for some relief it's worth the try. I've been using it within my homemade lactic acid body lotion because the skin exfoliates and this helps to keep the skin moisturised as it's shedding the dead skin: win - win. With so many ultimate blends to choose from, have you tried any from the range?